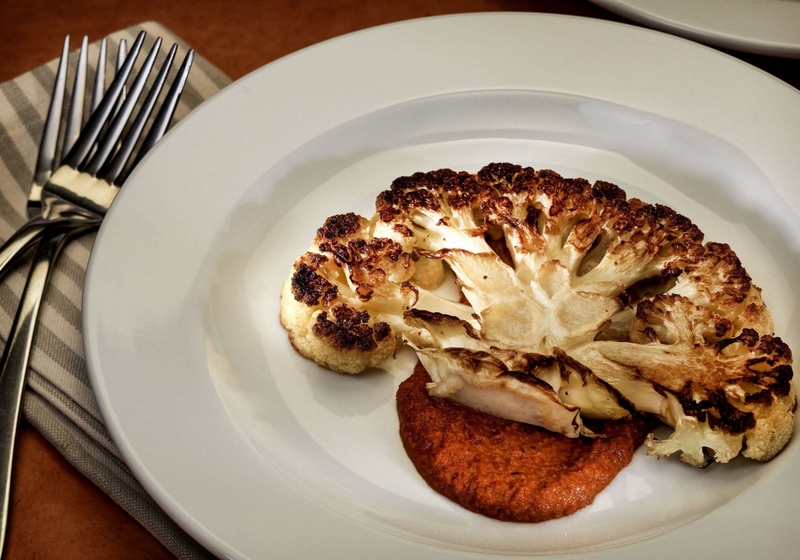 A smear of romesco sauce goes well with trendy cauliflower steaks. Anyone who can turn on an oven knows the difference between broccoli and cauliflower, right? One is green and shaped like a tree and the other is white and looks more like a brain. Well, it turns out it’s a little trickier than that. In fact, these two heady members of the brassica family are a lot more closely related than might be apparent. Actually, there are many members of the family that fall in between. There are even white broccolis, oddly enough. Perhaps the most recognizable example is the gorgeous romanesco broccoli, which looks like an experiment in fractal geometry that can fit on your dinner plate. Or, should I say, romanesco cauliflower because, despite the name it’s commonly given, it’s actually closer to that than broccoli, even if it is a pale shade of green. Besides that tricky bit of food geekery, another thing broccoli and cauliflower share in common is how well they respond to being cooked until they are fairly soft. This will come as a shock to those who still cling to the old “tender-crisp” style of vegetable cookery. But you really should give it a try. It took a while for me to be convinced as well. But after repeatedly being served versions of broccoli with pasta in which the vegetable, though still vivid green, had been cooked to almost a smearing texture, I had to admit that the flavor was better than the way I had been preparing it, where the florets were barely fork-tender. Just to be clear: I’m not talking about cooking these the way your grandma might have done. You don’t need to boil them into stinking sulfurous submission to get this effect. Try adding just another minute or two to the cooking time and I think you’ll be surprised by the difference. In the Sicilian broccoli pasta recipe from Oretta Zanini de Vita’s and Maureen B. Fant’s quite wonderful new book “Pasta the Italian Way: Sauces & Shapes,” the broccoli is cooked to the point that you can break it up with a spatula – first blanched and then sauteed in olive oil with pistachios, anchovies and chopped olives. Cut the cooking short and the broccoli is wild and a bit bitter. Give it the full run and you’ll be surprised at how sweet and mellow it turns. I’ve had the same experience with cauliflower. Cook it until it’s barely tender and it’s an “American Idol” type of vegetable, kind of sweet, a little bland and ultimately forgettable. Push it a little bit; cook it until it’s just soft enough to smash between your fingers, and it’s a completely different thing, deep and complex with a flavor that’s slightly mustard-y and even has a whiff of truffle to it (or is that my imagination?). 1 hour, 10 minutes. Serves 4. Heat the oven to 400 degrees. Line a jellyroll pan with aluminum foil. Bake the hazelnuts until they are fragrant, about 10 minutes. Remove to a kitchen towel and rub them in the towel to remove as much of the papery peel as you can. Add the almonds and the tomato to the pan and return it to the oven. Remove the almonds when they are fragrant, about 5 minutes, and continue roasting the tomato, turning after another 5 minutes, until it is beginning to char and soften, 20 to 25 minutes in all. Leave the oven on if cooking the cauliflower steaks immediately. In the meantime, cover the chile with boiling water and set aside to soften. Heat 2 tablespoons olive oil in a medium skillet. Add the bread and fry until lightly golden on both sides, about 2 minutes per side. Remove from heat and transfer the bread, leaving the oil in the pan, to a food processor. Discard the oil. Add the garlic, hazelnuts, almonds, tomato, chile, pimenton and three-fourths teaspoon salt to the food processor and pulse until finely ground. Add three-fourths teaspoon red wine vinegar and with the processor running, pour in the remaining tablespoon olive oil in a stream to make a thick, chunky cream. Thin the sauce, if desired, with water, pulsing in a little at a time. Season to taste with more salt and vinegar if necessary. Romesco is served at room temperature. This recipe makes about 1 cup sauce, more than is required for the dish. Store the remainder tightly covered in the refrigerator for up to a week. Heat the oven to 400 degrees and line a jellyroll pan with aluminum foil. If you have just made the romesco sauce, you can use the same pan. Trim away the leaves of the cauliflower and enough of the base to allow it to sit flat on the cutting board. Leave as much of the core as you can, as this is what will hold the cauliflower together during cooking. Using a very sharp knife, cut the cauliflower into half-inch vertical slabs, working from the center out for the largest steaks. You should have four steaks; save any remaining cauliflower for another use. Heat the oil in a large nonstick pan over medium-high heat and add the whole, peeled garlic clove. Cook the garlic until it is light brown and blistered and then discard the clove. Cook the cauliflower steaks two at a time, frying on each side until lightly browned, about 2 minutes per side. When the underside begins to brown, sprinkle the top with salt and flip the steaks over. Be very careful turning as the cauliflower is delicate and will want to break apart; using 2 spatulas is a good idea. When the second side is browned, sprinkle with a little more salt and transfer them to the jellyroll pan. When all the steaks are browned, roast in the oven until they are quite tender, 15 to 20 minutes. Spoon a couple tablespoons of romesco on the serving plate where the stem of the cauliflower will be. Place the cauliflower, browned side up, on the plate over the sauce and serve immediately, passing the remaining sauce at the table. Each serving: calories, 248; protein, 6 g; carbohydrates, 15 g; fiber, 6 g; fat, 20 g; saturated fat, 3 g; no cholesterol; sugar, 5 g; sodium, 298 mg. Note: The romesco sauce is loosely adapted from “Honey From a Weed” by Patience Gray.